Designing a mobile-first website with Bootstrap is quick, easy and cost-effective. Prototype eye-grabbing new websites with Justinmind’s new Bootstrap UI kit. Looking to get straight into designing with a flexible, easy-to-use UI kit with our prototyping tool? Then look no further than Bootstrap. Bootstrap is among the most popular open source web design frameworks in the world. Formerly known as the Twitter blueprint, this front-end framework has become the go-to choice for many web designers and developers. The pinnacle of Bootstrap is simple design and intuitive UX. In this post, we’ll examine the many benefits of designing a website with this aesthetically appealing library, as well as provide an example of how to design a website with the Justinmind Bootstrap UI kit. Bootstrap was born in 2011 and is the result of a group of designers and developers getting together at Twitter. Jacob Thornton and Mark Otto, who were at the forefront, helped to develop what they would later call the “Twitter Blueprint”. 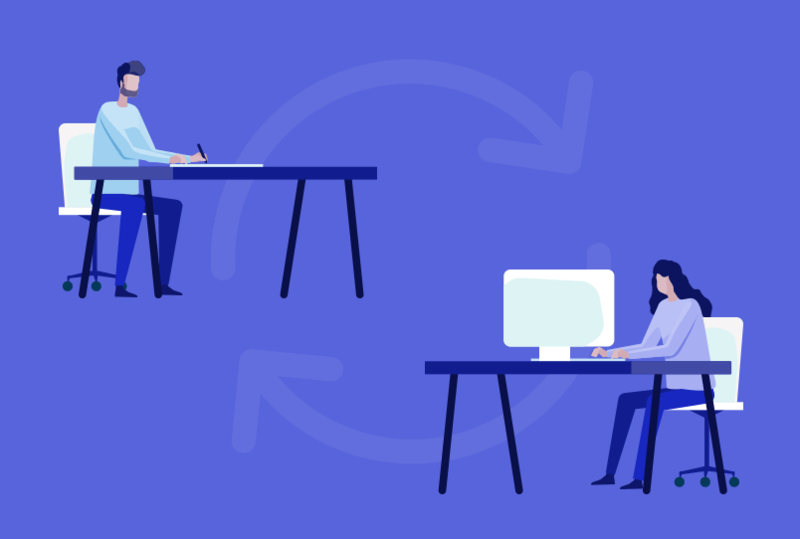 The idea of this was that the company would use the framework as a point of reference across all their internal tools. As Mark Otto stated, this allowed them to “document and share common design patterns and assets within the company”. During a hack week, as developers from across the company contributed to the blueprint, they soon realized the potential for the product to help web designers and developers across the world, and in 2011 they made the framework available as an open sourced project. Get Justinmind’s new Bootstrap UI kit and start creating mobile-responsive websites today! As a framework, Bootstrap is highly adaptive in that it allows for endless possibilities when it comes to design. On top of that, it is a responsive library that allows for mobile-first development, which is tantamount to modern website design. The great thing about Bootstrap is, that while offering designers a simple but effective design tool, it also makes life easier for programmers. The main reason for this is the way in which it employs CSS. CSS stands for cascading style sheet. It is a language that is used to describe how a document written in a markup language is presented, the most common markup used being HTML. CSS basically shows how different HTML elements will be displayed, either on screen or on paper. This in turn leads to smoother designer-developer handoff, in addition to less time and money needed to get your website up and running. The Bootstrap framework comes with its own interactive grid system that has predefined layout classes and templates. Grids are what enable designers to improve their products because they create hierarchy, aligning different elements and creating a more thoughtful and consistent design. Interactive design means that a design is flexible and can adapt to any screen size. It’s one of the crucial aspects that underpin Bootstrap’s responsiveness. Working with interactive grids is quick and straight-forward when it comes to designing for different resolutions and screen sizes. The fluidity of Bootstrap’s 12 column grid layout lends itself perfectly to interactive design because it not only helps to define the structure but also the way in which components adapt to breakpoints. It’s also customizable in the sense that developers can select the features that are required for the prototype they’re working with and discard the others. For the designer this means freedom to create any concept imaginable and frees up your attention to focus on the end user. Our Bootstrap UI kit comes with all the components and widgets you need to start prototyping your mobile-and-content-first website. Everything has been organized into categories, so finding what you need to work with is a piece of cake. Components: this section includes all the panel elements, alerts, cards and badges you could need. The cards come in various recommended layouts and also include a card header and footer. There is a jumbotron hero unit for calling attention to featured content, as well as a carousel fixed with three pages and an in-built interaction to navigate between them. There is also a neat accordion panel for collapsible group items, in addition to a wide selection of popovers and tooltips. Popovers are handy for displaying content on Mouse Over, while tooltips are good for displaying smaller quantities of content. Navigation: here you’ll find a basic breadcrumb menu, dropdown and dropdown split buttons in addition to vertical and horizontal navigation bases, one including a dropdown menu and one with pills. The pre-installed interactions in these navigation bases let you switch between sections. In this section, you’ll also find some helpful pre-assembled navbars equipped with a dropdown buttons and a search bar, in addition to an external one with a hamburger menu that is programmed to collapse the content it contains. You can also find a vertical and horizontal scrollspy in this section. Buttons: every type of button you could need for your webpage, fully customizable. Many pre-made samples are already there, such as warning, danger, success, info and link buttons. There is also a block level button, in addition to grouped, nested, vertical and dropdown buttons. Forms: this category gives you a range of input fields, including labeled inputs suited to different tasks. There’s also a textbox in this section, as well as a selection of progress bars, check boxes, radio buttons, sliders and a dropdown menu. Like most of the widgets in this library, all the basic interactions are already added to speed up the prototyping process. Widgets such as sliders are movable and the text fields can already be written in. Texts: this section consists of all the different text groups you might need such as page and example headers along with header subtexts, as well as general headers ranging from H1 through H6 and a body section. 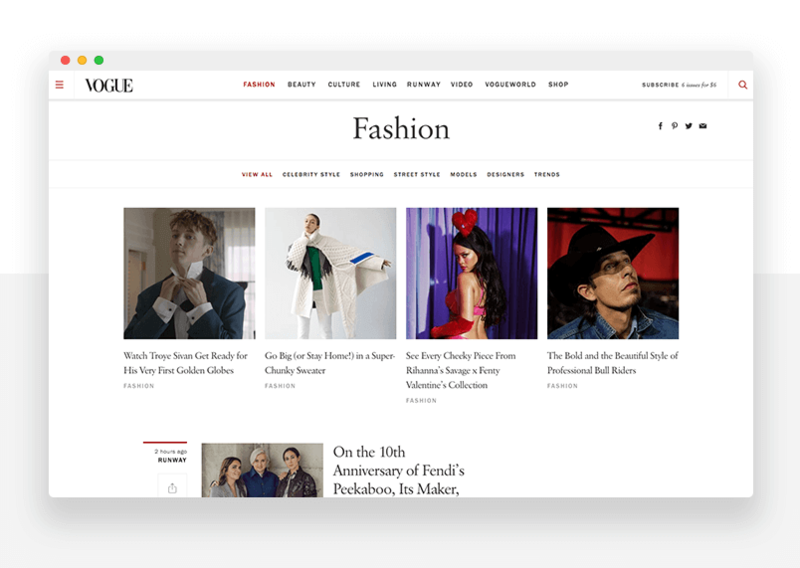 Fashion magazine Vogue’s website was built using Bootstrap. It’s a great example of how much detail can be fitted onto the screen using the Bootstrap’s responsive 12 grid layout. Using bootstrap web design, Vogue manages to cram a lot of information onto its homepage, without it looking crowded. The designers clearly put a lot of thought into the site’s navigation design, giving its content a clear hierarchical form. The most striking feature of this website is the large hero image that leads into a featured news story, followed by smaller images below that also link to further articles. Their aim seems to be to create a homepage that grabs the user’s attention while using the minimum amount of text – something which Bootstrap helps to achieve. There is also a clear hierarchy throughout the website which is evident through the logical use of breadcrumbs on each page, in addition to the main ones on the website’s header. 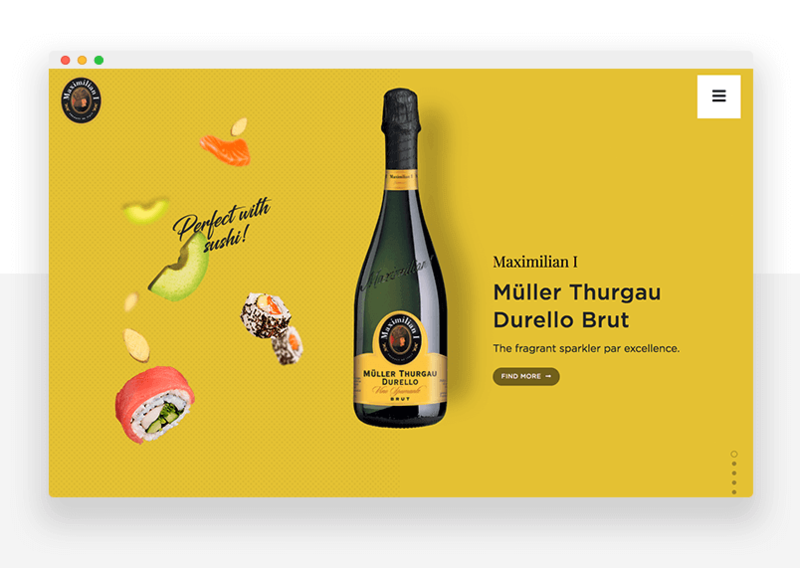 Maximilian is a historical brand of Italian sparkling wine managed by Cantina di Soave. Its website is the perfect example of a product reinforcing its brand identity through web design, and it illustrates the degree of power and flexibility that the bootstrap library bestows on its designers. The website has been crafted making sure that all elements are properly spaced out but perfectly aligned, and the user can scroll down, triggering the parallax effect. If you hover over the culinary suggestions, depending on which direction you move the mouse, the ingredients move in counter phase, creating a very realistic three-dimensional animation. All of these effects scale down perfectly on smaller devices, while still maintaining that minimalist, spacious feel. The hamburger menu turns translucent in the mobile version of the website so that the rest of the content under it is still visible. Each “Find More” button is clearly visible under each product, opening into a card containing further detailed information about them. The designers of this website clearly made content layout one of their prime strategies. Pop Art Studio is a web development and design service from Serbia and has made a pretty good job of its own website – using Bootstrap. 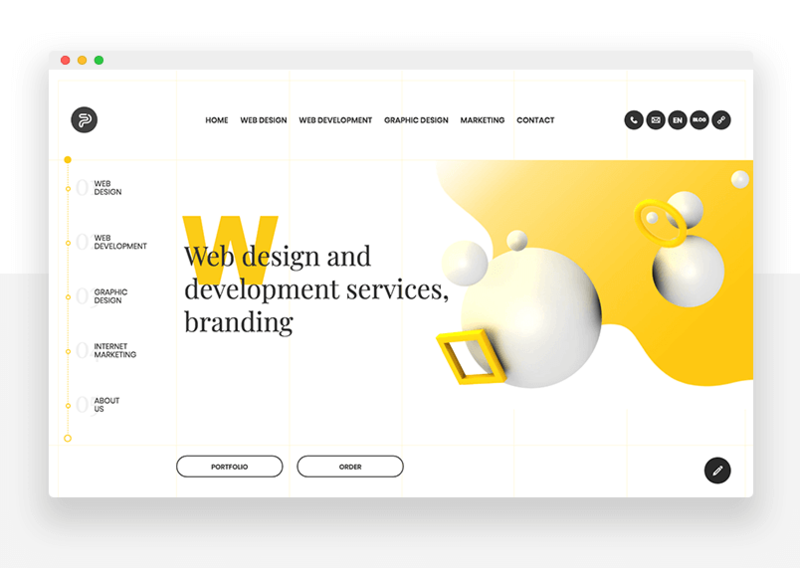 On entering the site, the first thing that jumps out is the bold yellow color that contrasts with the otherwise minimalist design, along with the dynamic hero image – one of the most notable effects of the site. The designers take advantage of the 12 column grid layout to showcase the company’s full design potential. Great button design is another feature of this website. Hovering over any button on the website, the user will see an arrow sliding past, as if shot by a bow. These minor interactions create a more immersive experience for the user. Call to actions are clearly visible, displaying the most important information first, such as the “portfolio” and the “order” buttons. It is also a great example of how effective Bootstrap design can be as a mobile first developer language. The details of this website scale down perfectly to smaller mobile and tablet screens, with the breadcrumbs compressed into a hamburger menu on the smaller resolutions. 1: Download Justinmind and start your free 30-day trial. 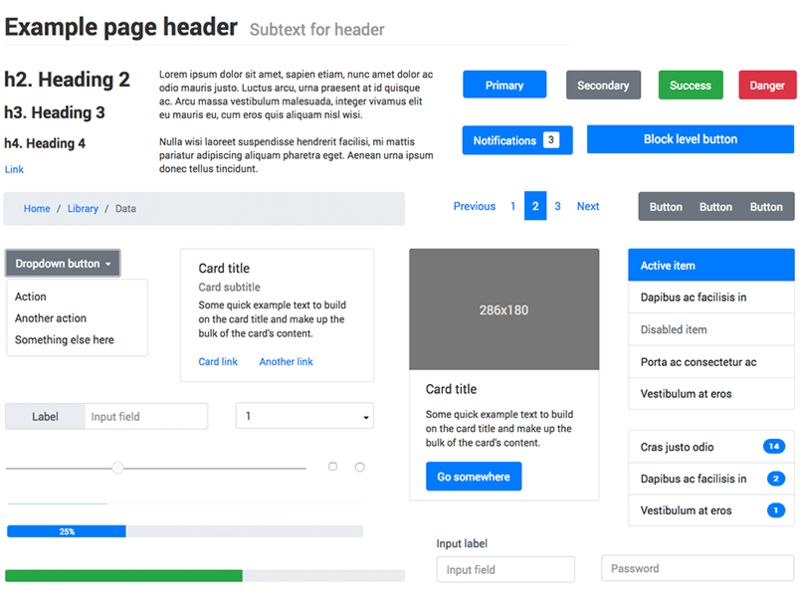 2: Download the Bootstrap UI kit from our widgets page. 3: Import the UI kit into the prototyping tool. You’ll see the widgets there, on the left-hand side. 4: Create a new Bootstrap web prototype. Designing a Bootstrap website with our UI kit in Justinmind is quick and easy. 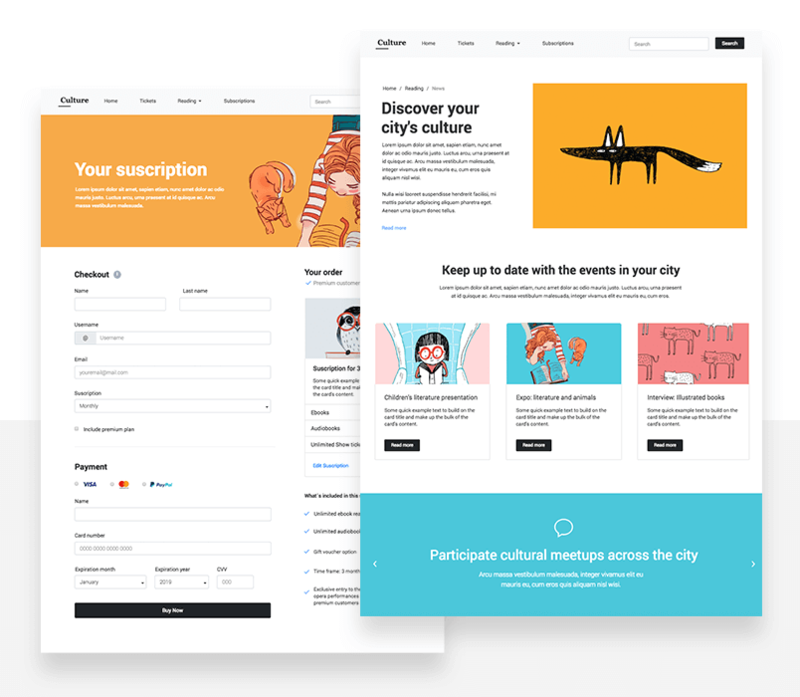 Let’s imagine we want to design a website about culture in our city. Our website should have a simple layout with a homepage that advertises all the features of the site. By simple layout we mean that the content of our site will be organized in a clear and intuitive way, so that the user can quickly and easily find the information that is relevant to them. When considering the layout of content on our site, we’ve decided that ordering it into sections is what the doctor called for. You decide that there should be a section to buy tickets to events, as well as a section for reading featured literary posts and interviews, and also a Subscription section for people interested in the newsletter. So let’s start with the top of the page. We’ll choose a simple Navbar widget and drag it to the canvas to edit the text; in this case we’ll include the following four options: Home, Tickets, Reading and Subscriptions. These will showcase the main features of our site. The Navbar provides a dropdown menu feature whose text options can be edited or expanded. The cool thing about this feature is that the interaction is already built-in to the widget, saving you time adding it in. In this dropdown menu we’ll add some options to redirect the user to the different pages of the website. Conveniently, the search bar that is featured in this widget also has the text input interaction, like other text fields in the library. Now let’s add our navbar to the templates section so that it remains fixed in place for all pages. For all intents and purposes we’ll name it “Navbar”. Fixing the navbar to the a-axis and choosing “pin to top” for the y-axis will enable it to remain at the top of the page as the user scrolls. Next, we might think about adding a H1 text to describe the body of text on the homepage. We’ll add in a breadcrumb menu above the text to let the user navigate more easily between the content. Conveniently, the breadcrumbs already have an “on Mouse Over” interaction built in to them which highlights the text, meaning we just have to add the appropriate interactions to link them to the other pages. The next part of our homepage will be populated with cards to succinctly showcase some of the interesting new content on our site. We’ll denote this next section with a H2 title and a text body. In this example we’ll use the primary cards that consist of an image, a paragraph and a button. To add our chosen image to the card, we simply select the rectangle and go to the Background section under Properties. Here we can find a dropdown menu with different options for resizing our image, and select the one that best fits ours. The buttons also have that practical built-in “on Mouse Over” interaction, allowing us to focus on the button’s design and the subsequent page it links to. In this case, we’ve just altered the text and the color of the button. 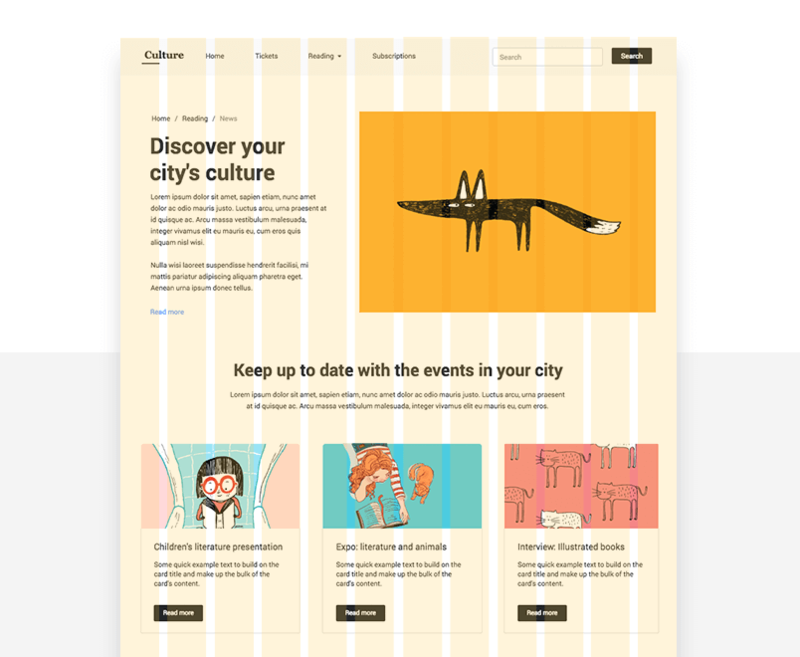 The lower part of our homepage will feature a carousel component demonstrating the different events around the city that our site will be promoting. The component comes with three slide labels (of which more can be added) that also have interactive controls to switch between slides. Here we’ve given each one a catchy title and changed the icons and the color. Each slide will link to a different page on our website. Next, we’ll create a page for managing new subscriptions. We’ll add a jumbotron hero unit with a H1 text and a paragraph. On this page we’ll compose a sign up form using input fields for Name and Last name; we’ll use the Input Label 2 as an append field for the username to begin with “@” à la Twitter, as well as a simple dropdown menu allowing our users to select the type of subscription they want. The title of our sign up form will be created using a popover that provides the user with extra information (denoted with an “i”) on Mouse Over. Below that, we’ll provide a checkbox to include the premium plan in their subscription – you’ll notice that the checkbox already has the checking interaction added. The second part of this page will be the payment details where we’ll offer the user the option to select how they want to pay: by Visa, Mastercard or Paypal. For this, we’ll drag three radio buttons to the canvas and line them up. Adding these to a group under Outline will have the cool effect of only allowing one to be checked at a time, eliminating the need to add a conditional event. A few more text fields, dropdowns for credit card expiration and a block level button and we’re good to go with the second page. After our subscriptions page is finished, we’ll go back to the homepage screen and add an event to the subscription button to link to the subscription page – voilà! We’ve already created a simple Bootstrap prototype for our cultural website! As you can see, prototyping your website using Justinmind’s Bootstrap UI kit is a great idea if you want to design an attractive, modern-looking, mobile-first website that provides an easy transition from design to development and offers your users an intuitive experience. So what are you waiting for? Get Justinmind and start prototyping your Bootstrap website today!